I offer one to one flight instruction for Complex aircraft, tail wheel conversions (Citabria), short field/farm strip training and the IMC rating. I just wanted to say a very big thank you for helping me take the first steps back to SEPs and introducing me to tail dragging. I wasn't entirely sure I had done the right thing by going for the tail wheel RV14 ( as opposed to the tricycle) but I now have no doubt. For sure I've still got much to learn and practice but that's the great thing I love about flying.......there is always something to learn! I very much appreciated your pragmatism and the contribution of Phil. I shall be in touch with him in due course to get my IR renewed and I was very impressed generally by Staverton.....which I think will probably be the best place for finishing my build off and getting it into the air. 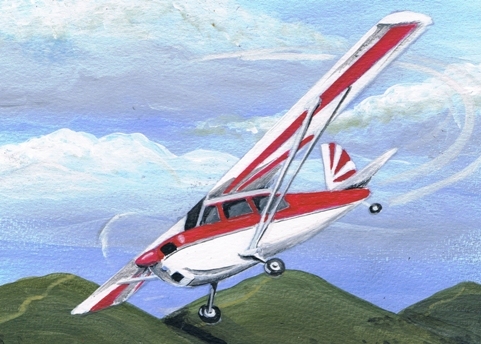 “Having flown fixed-wing Microlights for some six years (mostly “around the windsock”), a combination of circumstances found me Microlight-less but having agreed in principle to buy a tailwheel Group A plane (long story –don’t ask!). So, I found myself in a position where I had to convert to both an SSEA licence and tailwheel type rating – under a tight timescale. I’d previously seen the advert for Aircraft Differences Training in the Microlight Flying magazine and had already noted James’ approach of one student at a time and as concentrated a course as possible. This appealed to me as, due to instructor availability, weather suitability and my availability, it had taken some 2 years (and probably twice as many hours as necessary) to gain my Microlight licence; the fact that James teaches in a tailwheel Citabria seemed like a good omen too! beginning. Taildragger flying - or more correctly, taking off & landing – is challenging but immensely satisfying when you get it right. I unhesitatingly and absolutely recommend James as an instructor; his technique is relaxed, and without seeming to he pushes his student hard – it wasn’t until after each lesson that I realised just how much he heaps the workload on to just before the point of student overload. Additional benefits are that you get to fly from the busiest GA airport in the UK; you get to visit tiny farm strips and larger airfields and as a result of these you have to use the radio extensively – all of this being particularly valuable to me in building confidence since, like a lot of GA pilots, I had previously been very hesitant about talking to the professionals and had therefore limited my flights to smaller airfields. James also gives you as much groundschool and briefing time as you want & need; safety is of course paramount and discussed extensively, and my navigation skills are now much better than they were (I thought they were OK anyway but that was proven not to be the case!). I have also flown in conditions so marginal that I would not have previously considered going up in them, but so confident in James’ assessment that I was happy to do so (the mandatory IMC training was particularly, um, interesting). Finally, should you be further away than a daily “commute”, James’ neighbour has a self-contained apartment for rent on-site, set in beautiful countryside. In summary – just do it, you won’t regret it! Many thanks once again for an excellent days flying. Thoroughly enjoyed it and learned a lot at the same time, which at the end of the day is what any student wants. I wouldn't hesitate in recommending you. The more individual approach, location and aircraft are just great! All the best and hopefully see you again in the future. Just wanted to thank you for the voucher flight the other day - a gift from Susan. I had a thoroughly excellent experience which I much enjoyed. I was really grateful that you trusted me to fly the Citabria including the take-offs and landings. I felt very comfortable in the aircraft and flying with you. Many thanks indeed. I recently completed the Microlight to NPPL SSEA training on the Citabria. I achieved this inside 2 days, started on the Wednesday morning, went solo after lunch, flew 'on instruments' to Gloucester to take the two written exams that evening; then on the Thursday passed both the NST and GST. It was hard work but some of the most enjoyable flying I have had in years. James is an excellent instructor with a professional and reassuring manner, he certainly inspired me with confidence. A wonderful setting to fly from and the accommodation and hospitality laid on by Bunty was also first class. I would highly recommend this course to anybody contemplating a taildragger conversion and or an upgrade to the NPPL SSEA. I loved flying the Citabria. Martin Culley Flying Instructor Fixed Wing Microlight. Just wanted to thank you for the NPPL SSEA conversion training that I recently undertook. I thoroughly enjoyed the whole experience and the Citabria was great to fly. I do think that you offer a much better route than by going to a larger organisation, by spending several days with dedicated one to one training and what seemed like unlimited briefing and discussion time, was far superior to turning up, fly for an hour, then go home for another week. I still find it hard to believe it was all carried out in five days including the exams and tests. I did feel you pushed me, but that was exactly what I needed to take my flying up to the next level. If you do have any enquiries that want an unbiased opinion please feel free to give them my number if they want to have a chat with me. Having flown various aircraft over the past 23 years with the RAF, I wanted to try something different. After a quick search on the internet I found Aircraft Differences Training run by James Peplow, who coincidentally had previously been my PPL instructor. I opted for the tail wheel conversion and farm strips course. The operation is based in an idyllic setting within Herefordshire's wonderful scenery. The course was absolutely fantastic and despite having been lucky enough to experience all sorts of flying during my career, it provided me with new and different challenges whilst being thoroughly enjoyable throughout. James is a highly experienced instructor who has an infectious enthusiasm for all things aviation. Pleasure flying and instruction should be an enjoyable experience and James certainly ensures that, tailoring the whole experience to the individual. I defy any pilot not to come away with a big smile on their face, I certainly did! (the beautiful Citabria), how to safely and accurately operate and fly a tail wheel layout (having never tried before), how to fly in and out of amazing farm strips where the space between the trees at times didn’t seem wide enough for the span of the Citabria, and to come away with a huge smile on my face is testament to the way James approaches every student with a ‘can do’ attitude. His enthusiasm, vast experience and approach to flying and people made me feel able to try landings and take-offs that I had never thought would be within my capability, certainly at this early stage in my flying career. I have come away with a desire to safely build on what James has introduced me to. Trust me, standing on the runway on that first morning and thinking “there’s no way you can take off or land here” (the videos don’t show the half of it!) has given way to the thought “ok, I won’t be trying that on my own just yet, but I can now see how to build towards it." James offers a relaxed teaching style based on sound knowledge and experience and works with 'you' to focus on what you're trying to achieve. Great value, fun and very worthwhile. I've just received my PPL through the post this week having successfully completed an intensive 3 month course with James. It needs to be said that James is a great teacher and very accommodating. My experience of previous flying schools wasn't good as they lacked any real organisation often wasting my valuable time leaving me hanging around for hours just to get my lesson. I would definitely recommend James to others wanting to get their wings. From first contact with James we swiftly assembled a compressed program that also fitted with various other schedules (and of course, the weather!). James could not have been more accommodating with a combined brief of differences training on a new type together with my bi-annual renewal as well as switching from JAR to EASA Licenses & Ratings. The Licenses' switching was probably the most demanding aspect for me but James led me through the process with aplomb. Similarly with our flying, I can look back and feel that I perhaps learned more in that time that I had done in my initial flight training. James has a wonderful easy going manner and great humour but never losses sight of the task in hand and thereby cultivates assured confidence through clear understanding. Quite simply, whatever your requirement might be, I could not recommend James more highly. J. Mack EGCW.